Great Pyramid of Giza. Photo by Nina Aldin Thune. Pharaoh Khufu must be rolling in his monumental grave. Since its construction in 2560 BC, the Great Pyramid of Giza stood as the largest man-made pyramid ever built*. For 3800 years, it held the title of the tallest man-made structure of any kind. It wasn’t until the Industrial Revolution that our buildings began dwarfing this wonder of the ancient world. Even still, the Great Pyramid is massive, with a volume of 2,580,000 cubic meters. But there is another pyramid, more massive than Giza, and it wasn’t built to entomb a mighty king. It’s not a monument of any kind. The largest (by volume) pyramid in the world resides in Alberta, Canada and it’s made entirely of sulfur. For background, please see our original post – Secrets and Sulfur at the Morehead City Port. Over the last two days, I’ve dug through the PCS Phosphate Environmental Assessment, checked out some of the press reports, and talked to an insider from their Aurora facility. After pouring through what little data is available, I have six concerns that I would like to see addressed before this project is approved. Proposed site. 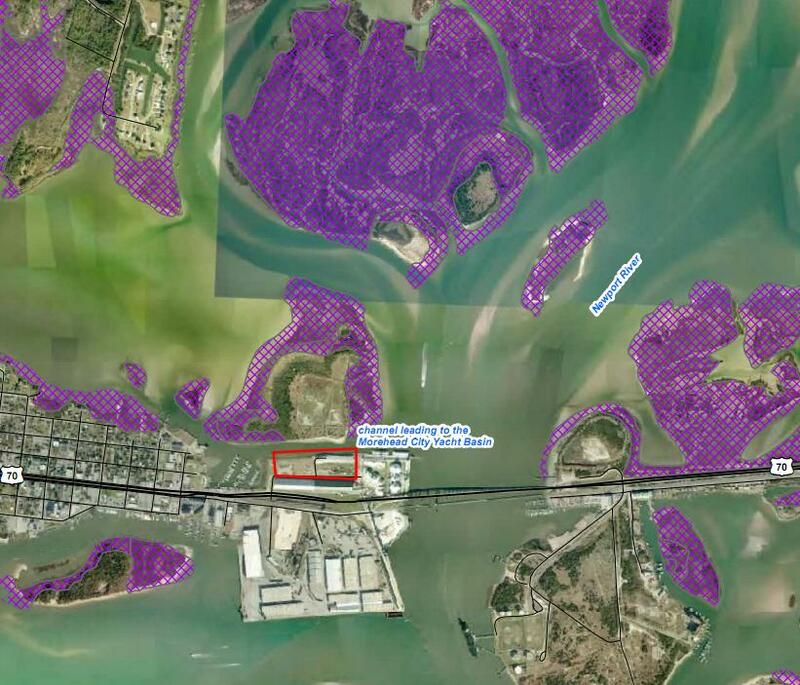 Wetlands indicated in purple. From the PCS Phosphate EA. The news caught us by surprise. PCS Phospate, a division of Potash Corp. and one of the largest suppliers of fertilizer in the world is planing to build a Sulfur processing plant in Morehead City. Seemingly overnight, it had grown from a few rumors to an announcement that the final permitting and funding process was already underway. Initial planning began almost a year ago, and an environmental assessment was produce in in December 2010, but at no point during this year of closed door meetings was there ever a public review. The first official notice occurred when an adjacent landowner was informed of the expansion.